1. In a pan add tamarind extract, rasam powder, turmeric powder and salt. 2. Allow it to boil for some time. 3. Add the pepper powder with rasam. 4. Cook the red gram and extract 3 cups of dal water. 5. Fry mustard seeds, red chilli and curry leaves in a tsp of ghee. 6. Mix with the rasam. 7. Pour 2 cups of dal water in rasam. 8. Continue to boil for another 5 to 6 minutes. 9. Add remaining 1 cup of dal water and simmer for a few minutes. 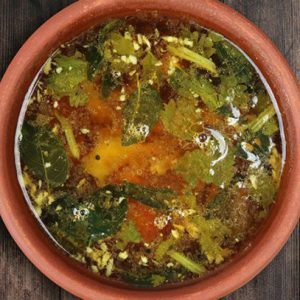 Feel free to comment or share your thoughts on this Pepper Rasam Recipe from Awesome Cuisine.